The end of August is a bittersweet time in Minnesota. On one hand, the sudden appearance of school buses practicing their routes through neighborhood streets is a reminder that school, and the end of summer, are right around the corner. But on the other hand, we have the Minnesota State Fair to look forward to. A few years ago, my family came up to attend the State Fair for their very first time. They instantly fell in love and it has been a tradition ever since. And this year was no exception. The first stop we made was at the Midtown Global Market to try the infamous camel on a stick. We hadn’t planned on that being the first thing we ate, but it was near the entrance and we didn’t want to risk being too full at the end of the day to order it. The nice thing about going with a group is that you can share a little bit of everything you order, which is especially helpful when you’re trying something new and aren’t sure if you’re going to like it. As we passed along this lump of exotic meat, we unanimously agreed that we didn’t enjoy it. My mom instantly spit it out, but Ryan, my dad and I hung in there a little longer. The meet was ground, but was pretty chunky and somewhat grisly. I’m not even sure what to compare it too. It tasted a little more “gamey” than your typical hamburger, but the spices used to flavor the meat were too overpowering for me. It came with a zesty mustard sauce that didn’t help to cover the flavor of the meat. Perhaps we aren’t adventurous enough eaters, but this one wasn’t going to become a favorite item that we order every year. I’m glad we tried it, but it was time to move on to other foods. Next on the list was my dad’s all-time favorite: pork chops on a stick. He looks forward to this stop all year long. My parents and Ryan all gave these an enthusiastic two thumbs up. My mom even bought the seasoning and tried to recreate them at home, but said it just wasn’t the same as the fair. The day we went to the State Fair, the temperatures were expected to hit the upper 80s, perhaps the low 90s and be coupled with soaring humidity levels. We went in the morning to take advantage of the early day coolness, but even after walking around for about an hour we were already pouring sweat and very thirsty. Last year we were intrigued by a sign offering Beergaritas, a combination of Leinie’s Honey Weiss beer and frozen margarita mix. They were surprisingly tasty and refreshing. And with the constantly rising dew points, refreshing was sounding pretty nice. So the next stop was at the beergarita stand, which was conveniently located next to the stand selling beignets. While my parents and Ryan indulged on their frozen refreshments, I went next door and got us an order of the wonderful fried dough. Although I’ve heard these aren’t exactly like the traditional beignets, they are still quite delicious. I mean, you can’t really go wrong with fried dough covered in powdered sugar can you? And when you’re splitting an order with three other people, it’s a little easier to justify the caloric intake, which I have to say is totally worth it. These are one of my favorite treats at the fair. Once we were cooled down and loaded with deep-fried calories, it was time to see some of the other attractions the fair has to offer. One of my favorite events of the day was the bee building where we learned about the different types of honey and even saw a cooking demonstration. Caramel apple in a bowl: hot, gooey caramel + crispy, juicy apples…need I say more? The corn was crispy, juicy and delicious! And Ryan’s favorite: a Pronto Pup, which is similar to a corn dog, but with a slightly different batter. And speaking of pups, we couldn’t go to the State Fair and forget about Murphy! Yes, even the dog got a treat on a stick. A vendor in the pet area was selling 2-for-1 dog biscuits on a stick (a rawhide stick). Even though Murphy was sad he couldn’t join us for the fun, he appreciated that we thought of him and brought a treat home for him to enjoy. Murphy is a big fan of the biscuits! On our way out, we made a point of stopping in the Dairy Barn. Every year, one lucky lady is crowned Princess Kay of the Milky Way as part of the Minnesota Dairy Princess Program. In addition to the prestigious title and crown, she and the members of her court also gets their faces carved into butter. Now this isn’t a little chunk of butter like the lamb mold you put on your dinner table at Easter, this is a 90-pound block which requires the sculptor and model to sit inside of a glass-walled refrigerator for 6-8 hours. It’s quite an artistic feat. And every year we forget to go see it. So this year, we kept reminding each other, “We need to go see Princess Kay!” Seeing the carvings in person was just as awe-inspiring as I imagined. And last but not least, our final stop on our way out of the fair was at Sweet Martha’s Cookies. This is a tradition for many State Fair visitors and Sweet Martha’s consistently has a long line. You can either order a cone of cookies or a bucket, which although is more expensive, is also convenient because you can put the lid on and safely carry your cookies home. Regardless of which you order, the servers pile the cookies on high so you get a towering heap of cookies that is well worth the price you pay for them. Sadly, this teetering tower isn’t always easy for people to control as they maneuver their way back through the line and the ground is littered with crushed cookies that didn’t make the trip. But the ones that survive and end up in your mouth are sure to offer you a truly euphoric experience. These are honestly some of the best cookies I’ve had – warm and gooey, fresh from the oven, and sure to leave at least some chocolate dribbled across your face or hands. But out eating adventures weren’t over yet. 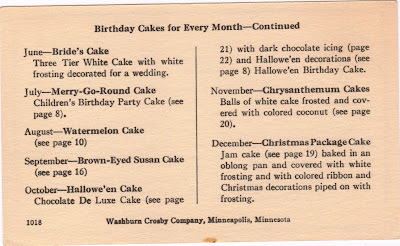 In addition to the Minnesota State Fair and all the fabulous area restaurants we hit while my family was in town, I also shared a special cake from The Found Recipe Box. 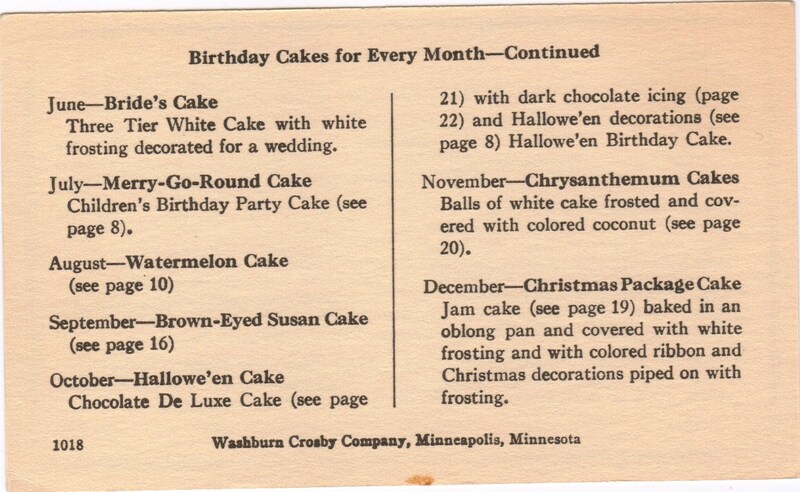 The August Birthday Cake of the Month was supposed to be a Watermelon Cake, but when I looked in the New Party Cakes booklet, it wasn’t there. 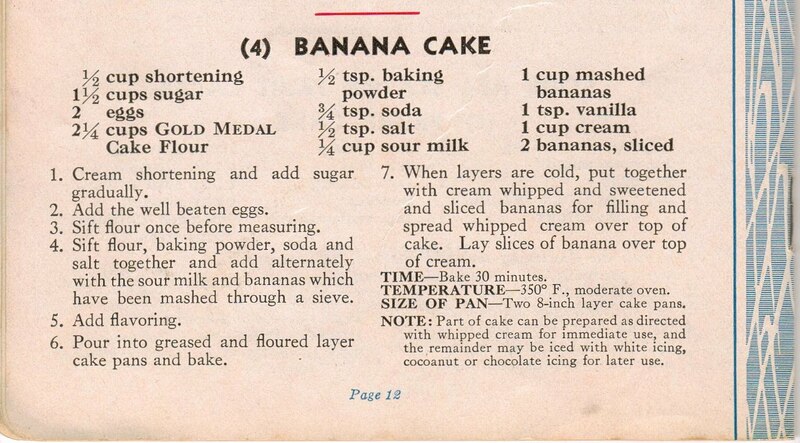 So instead, I chose an old family favorite: Banana Cake. One summer in Door County, my aunt purchased a banana sheet cake from a local bakery that was supposed to be for dessert. But it stayed out on the kitchen counter all day and every time someone passed by, a little chunk went missing. Needless to say, by the time dinner rolled around, there wasn’t much of the cake left. However, the next morning, we awoke to discover my aunt had made a special trip to the bakery to get another one. 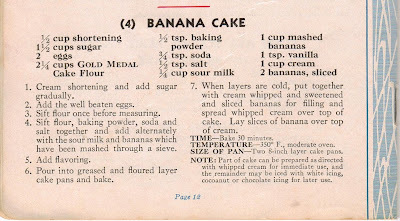 Ever since then, we have been searching for a banana cake recipe that would be as good and I was excited to put this one to the test. This version is a 2-layer cake so it isn’t as easy to pick at as the one we had as kids, but I made sure to make one thing consistent: the frosting. The Door County cake had a rich cream cheese frosting that melted in your mouth. For my version, I used my new favorite recipe for whipped cream, cream cheese frosting and it worked perfectly. After delivering each slice, Ryan, my parents and I all took a bite and instantly fell in love. This cake is moist, rich and wonderfully smooth. And despite all the fried, heavy food on a stick we ate earlier, this cake was a delicious and savory treat to end the day. Every year I’m sad to see the doors to the Minnesota State Fair close. There’s something magical and adventurous about those two weeks. They are packed with people watching, a plethora of exotic food options, and opportunities to pet horses and see all the other farm animals. The end of the fair also means the end of summer and our temperatures have already taken a turn to the cool side. But I also know that it will all be back next year and until then, I have plenty of recipes in the box to keep me warm and open the doors to all kinds of exciting new adventures.